Shikhar Lodge was initially just a small village house of the Gurung Family who lived in Tumling, a small sleepy hamlet in the Singalila ridge at an altitude of 9,600 ft. Years back, they decided to have just two beds for the trekkers to make some additional income which is otherwise hard to come by in this part of the mountains. 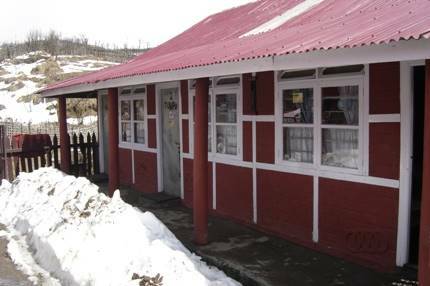 Neela Gurung, one of the daughters of the family, now in her middle age, has gradually expanded that single cottage to a lodge that comprises of multiple cottages having 64 beds. This colorful pink cottage colony is a nice accommodation in Tumling. 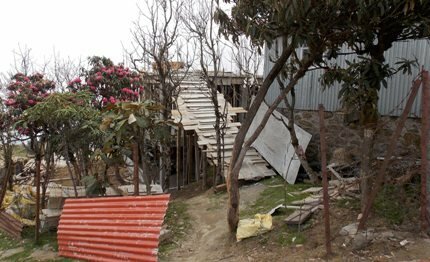 It is ideally placed for night stays for tourists on a safari to Singalila National Park as well for the trekkers who are on their way to Sandakphu and Phalut. As you approach Tumling from Meghma or Tonglu, this is the first set of cottages you will see in the area. The lovely little wooden cottages are surrounded by mountain ridges that get snow covered during the winter. The view around is awesome. As you enter the lodge premises, the main cottage (the original house) with the kitchen is on the right and another one with just three rooms in a row on the left. There is a passageway in between the two cottages. Further down, there is a narrow stairway from the left that leads to the other cottages a level below. The main cottage has a dining area right next to the large kitchen, a living room and couple of beds in an adjoining room that are all clean and maintained very nicely. You can freely move around between the rooms, living room and the kitchen as if it's your own house, so do several roosters and cats. In fact during the winter, the kitchen becomes the place for chit chats while soaking in the heat from the large earthen oven. You will find the drivers and even some locals who would gather here. 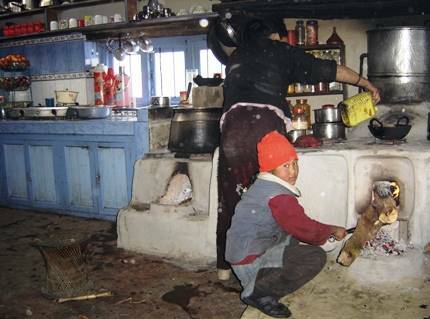 You can freely join them at the kitchen and have a cup of tea with them while exploring life in this remote mountain village. While all rooms come only with basic amenities like single or double beds with mattresses, tables and basic furnishing, they are all very clean. The best rooms are actually in the cottage which is to the left as you enter the lodge premises. These rooms are named after different flowers like Tulip. My favorite room is the one at the corner of this cottage. All rooms in this cottage and most others have attached bathrooms. Update April 2016: A new room named 'Dafey Munal' has come up at the end of the passageway with large glass windows and stone walls. This is now the best room with lovely views around. There is a new construction coming up at the back side of the cottages (a proper hotel with several floors) as an extension to the property. Neela mentioned that it would have better amenities and the rooms would likely be costlier. Although Tumling now has electricity, Neela also makes use of her solar units which she installed years back. There are low wattage light bulbs fixed in the rooms that work on this solar power and can be lit at night. You will also get a bucket of hot water in the morning. As I mentioned earlier, this is a family run business and you will feel at home. There are no professional staff here, you can't get them in Tumling. There are few children and young fellows who help Neela to keep running the show. Janaki, the elder sister of Neela is the main cook. Generally they always have rice, dal, some vegetables, eggs and even noodles. If you order, they can also get chicken from the village if available. Otherwise you will need to get chicken from Jhaubari, another village about 6kms away. Chicken curry prepared by Janaki along with paratha is simply delicious. During breakfast, you can get bread and eggs or parathas with vegetables. The Surrounding area of the Shikhar Lodge is wonderful with view of the mountains all around. There is a viewing area few yards away from where you can get a clear view of the Kanchenjunga towards north and Sandakphu peak to the left. From the viewing area you can walk down and see the village life. There are some 10-12 village huts here. Such tiny is the place Tumling. A room in the cottage costs Rs. 1,000 per night for two persons (Updated April 2016). Neela's brother Keshav Gurung (also the owner of Shikhar Treks & Tours) takes booking of Shikhar Lodge. He lives in Manebhanjan, the place from where the route to Sandakphu and Singalila starts. Email: [email protected] (Internet access in Manebhanjan is unreliable. So avoid emails. Better call him and talk over phone). 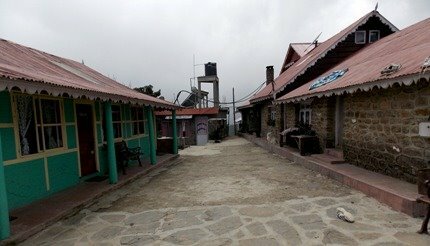 1) Tumling, the mystic village on the way to Sandakphu. Thanks Mr. Raj for this elaborate and lucidly written blog/website. It is of immense help whenever nowadays I travel to Darjeeling hills. I was there at Sandakphu and Tumling in 1st week November 2018. Not only in Tumling but all along the route throughout the Singalila National Park almost everybody said us that Shikhar Lodge has the best accommodation option in this route. So I was happy that I planned to stay at their place. But there is a disclaimer, you will receive warm welcome only if you are a foreigner or is a part of any organised trekking party. Atleast that was my experience. If you are a mere mortal Indian please try to stay at other place, may be Siddharth lodge which is placed just beside this. Now coming to my experience: I talked with Mr. Keshav Gurung and deposited the required advance money. Then when I reach Shikhar lodge their first expression was like "Why have you landed here, we have no information regarding you". Then they allotted me a room as if I should be grateful to them for that, in the old premises whereas they had rooms in the new building which were obviously better. May be they have thought that mere mortal Indians will not be able to afford their better accommodation. The room in the old premises was not dusted may be for last 6 months, was full of cobwebs and it lacked an inverter connection (whereas the new building had an inverter connection but that was for foreigners only). I know in these areas you should not crib for urban comforts, but if you are providing that in one part of your establishment you should have an option of that for all. I know this kind of attitude is not very uncommon in these areas. Even in Darjeeling you will get some accommodation not very welcoming to the Indians. These kind of places need to come out of their colonial hangover. Hello Raj, I have a few questions about Tumling. 1. We are planning to visit Tumling early June. Is it a good time to visit Tumling ? 2. Keshav's number is switched off since long. Any other possible way to book Shikhar Lodge? 3. We are planning to travel with a little over middle aged people. Will it be too much for them since it is mainly a trekking destination? Early June is usually a good time. You can still see some flowers and the sky mostly remains clear for the views. Mobile towers are all down in Manebhanjan area as some major repair work is going on there. Afraid the only other way is to send him emails. The only consideration here is that accommodations are quite basic. Middle aged persons should be fine if they can compromise with usual city comforts in lieu of nature. Hi, I was planning a trek at April first week to Sandakphu and Phalut. So I was hoping to know more about the Sikhar Lodge..
1. Rent of a room. There is no electricity ... only solar bulbs in the rooms which can be used after dark till 10pm. Food charge depends on what you eat... provision 300 - 500 per person per day. Room rate also varies depending on type and season. You can also get a bed. An average room rate would be about Rs. 600-700/- for two.